Join Us! From 3:00 to 5:00 PM. Rain or shine. 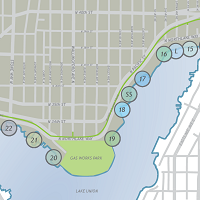 Join us on a family-friendly walk to learn about the public access points on Lake Union. Where: Waterway 22 (at the bottom of Stone Way N). We’ll meet where the Burke-Gilman Trail intersects with Stone Way N, in the parking lot area by Solsticio just south of N 34th Street). Then about 3:15 PM, we’ll begin to work our way east toward Waterway 15 (just to the west of Ivar’s Salmon House, at NE Northlake Way and 4th Ave NE). For those so inclined, join us after the walk for Ivar’s Happy Hour. What: We will visit each Waterway in Wallingford, generating ideas and making plans as we go. Join us and add your thoughts to the mix. Please help us to raise awareness of each Waterway by posting your photos and comments on Google Maps and other social media sites! Can’t make it? Use the map on the Shorelines page to find the public access points on the water. Let us know that you want to get involved with waterways by contacting us or by coming to a Monthly Meeting of the Wallingford Community Council (on the first Wednesday of every month). This entry was posted in Land Use, Quality of Life, Shorelines on September 27, 2017 by Frank Fay.